Tabata is a method of endurance training originally used by the Japanese Olympic speed skating team, and named for the scientist—Izumi Tabata—who studied its effect on fit college students. Although it hasn’t been studied for its potential impact on fat loss, many trainers believe that the Tabata protocol can be an amazing tool for getting lean as well as conditioned, and it’s often modified slightly so it can be done as amore user-friendly type of High-Intensity Interval Training. It sounds too simple—and too short—to work. In the original experiment, the university students got on a special type of stationary bike and performed seven to eight 20-second, all-out sprints, each separated by just 10 seconds of rest. After doing the routine 5 days per week for 6 weeks, the college kids boosted their aerobic fitness by 14 percent. 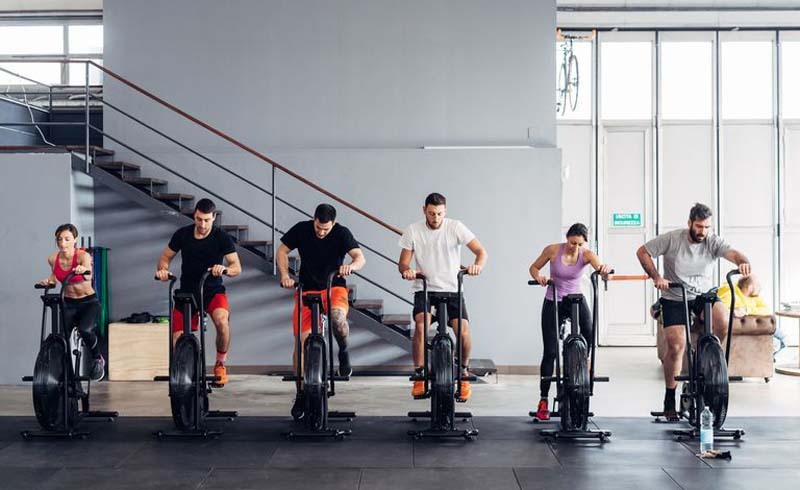 By comparison, another group—who performed a steady-but-moderate pace on the bikes for 60 minutes—saw an aerobic fitness increase of only 10 percent. In other words, the high-intensity workout lasting a mere 4 minutes was found to be more effective than an hour of moderate cycling. 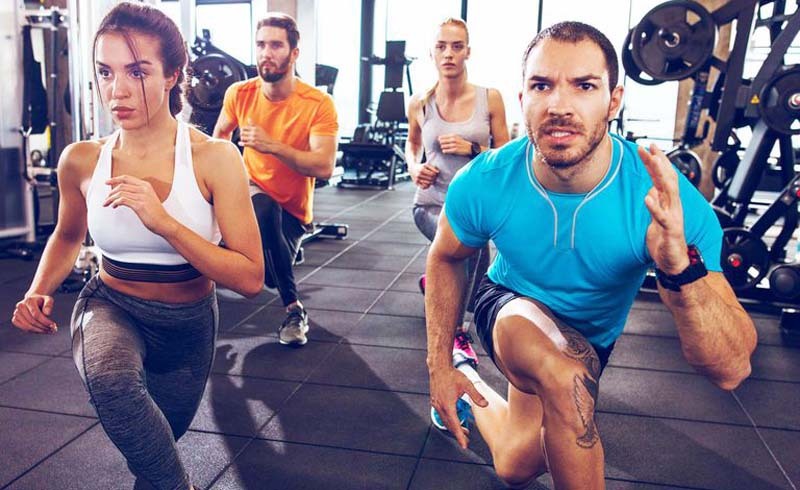 Even better, the Tabata participants saw a 28 percent improvement in anaerobic capacity—a measure of how long the subjects could exercise at their highest effort. The moderate-cycling group made no such improvements. The good news is that there is a way to solve both problems, while also making the Tabata method even more beneficial, according to trainer B.J. Gaddour. Instead of doing a single mode of exercise for each sprint, Gaddour alternates between two different bodyweight exercises that work your muscles in different ways. With this approach, fatigue doesn’t overtake you as quickly, which was the case for the study participants on the exercise bike. So, you’re still working hard for each 20-second interval, but you’re spreading the challenge out to a more manageable degree. Will Gaddour’s Tabata-style workouts improve your fitness as fast as it did for the Japanese college students? We can’t be sure. But a recent Auburn University study found that a similar Tabata-like routine using only bodyweight jump squats burned 13 calories per minute. That’s more than a 154-pound man can burn per minute of vigorous cycling (under 10 calories), so you’ll no doubt find it highly effective. And, there’s more. Because you’re better managing your fatigue, you can “stack” multiple 4-minute routines together for longer workouts that burn even more calories and fat. The key is to simply take 1 minute of rest between every 4-minute mini-workout. This way, you can recover briefly between routines and be able to give it your all in each interval. Plus, by stacking the routines, you can choose exercises that work your muscles and joints in multiple directions, challenging your body in new ways. 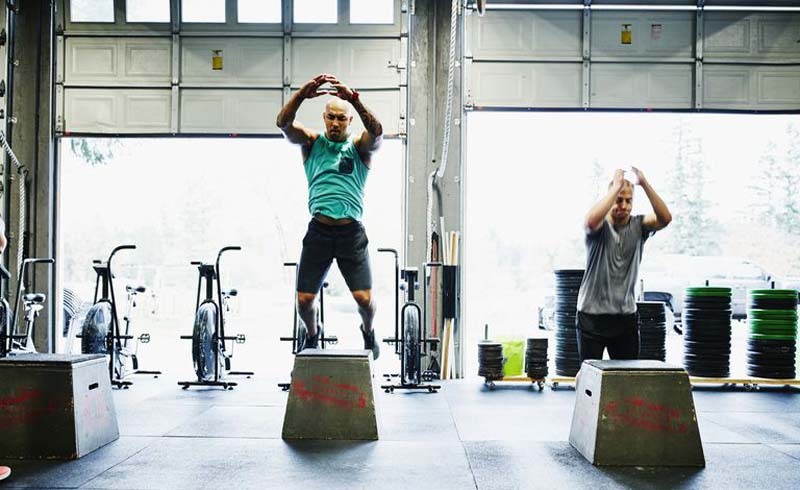 The following Tabata-style routines, which you can also find in the Men's Health Encyclopedia of Muscle, can be done on their own or combined with each other. For each routine, do the first exercise for 20 seconds and then rest for 10 seconds. Then, do the second exercise in the same fashion. Continue alternating the exercises for 4 minutes—that’s a total of eight 20-second intervals. Even though you’ll perform strength exercises in many of these examples, Tabatas aren’t strength training, so don’t go heavy. Use light loads that allow you to move quickly and get as many reps as possible. Aim for at least 10 reps in each 20-second work bout. If you choose to perform multiple routines in the same session, rest for 1 minute between them. If you want to keep going with one routine, simply perform it as many times as you can in the time you have. Place your hands on the floor at shoulder width, and extend your legs behind you. Draw your ribs down and brace your core so your body forms a straight line. Pull your shoulder blades together as you lower your body toward the floor, tucking your elbows 45 degrees to your sides. When your nose is just above the floor, press backup, spreading your shoulder blades apart at the top. Stand with feet at shoulder width and your toes turned slightly out. Without letting your feet actually move, try to screw both legs into the floor as if you were standing on grass and wanted to twist it up—you’ll feel your glutes tighten and the arches in your feet rise. Take a deep breath into your belly and lower your body down. Push your knees out as you descend. Go as low as you can, while keeping your head, spine, and pelvis aligned, and then extend your hips and knees to return to standing. Stand with your feet at shoulder width, holding a dumbbell in each hand at shoulder level. Keeping your ribs down and your core braced, press one dumbbell overhead and then lower it as you press the other one up. Continue alternating sides back and forth quickly. Grasp a kettlebell by its handle with both hands, or hold a dumbbell by one of its ends at arms’ length. Stand with your feet shoulder-width apart and, keeping your head, spine, and pelvis aligned, “hike” the weight back between your legs. Extend your hips explosively, driving through your heels and squeezing your glutes. Use the momentum to swing the weight up to eye level. Follow the weight as it falls with your torso and arms again, allowing it to go back between your legs—but keep your spine and hip alignment. Get into a pushup position, and then bend your elbows to lower your forearms to the floor. Hold your body in a straight line. Jump your feet out to each side as if you were doing a jumping jack, landing on the balls of your feet. Jump your feet back in. Perform jumping jacks, but open your arms wide out to your sides when you spread your legs. As you bring your legs in, clap your hands in front of you like a seal. Get into a pushup position—hands on the floor at shoulder width, and your body in a straight line from your head to your heels. Drive your left knee up to your chest, and then drive the right knee up while simultaneously extending the left leg back again, as if running in place with your hands stationary on the floor. Each time you bring a knee up counts as one rep. Keep your core engaged and your hips level with the floor. Stand on one leg and jump laterally, landing on the opposite leg and reaching behind it with the trailing leg. Immediately jump back to the other side. Get into a pushup position behind a box that’s low to the floor. Maintain alignment in your body while you reach one hand at a time to tap the box, replacing your hands in the pushup position after each tap. Use the same box as above, set in front of you on the floor (or imagine one, if you’re concerned that you might accidentally kick it across the room). Shuffle your feet like a boxer, touching your toes to the box, one foot at a time.